Liz believes in the power of creative work to trigger change. She is perhaps best known for ‘Resistance’, a moving image installation and durational performance which raised issues of disability discrimination in contemporary society through an exploration of Aktion-T4 – the Nazis’ first official programme of murder which targeted disabled people. The controversial performance took place on Trafalgar Square’s Fourth Plinth, during which Crow was seated in her wheelchair in full Nazi regalia, and was named one of the Guardian newspaper’s top ten plinth contributions of 2009. Liz became a disabled person when she was ten; however, it was not until she experienced discrimination at university, which forced her to leave her medical degree, that she began to question her identity and rights as a disabled person. 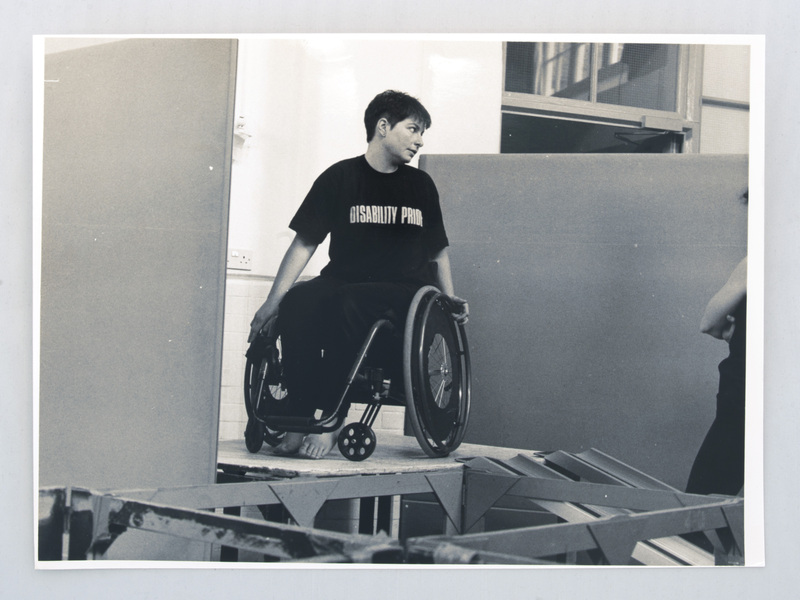 After discovering the social model of disability, Liz became increasingly involved in disability equality training, disability arts and direct action, and joined a number of disabled people’s networks, including the founding committee of London Disability Arts Forum (LDAF). She is creative director of ‘Roaring Girl Productions’, a creative media company which she founded in 1999, which combines high quality creative work with practical activism. Productions include ‘Frida Kahlo’s Corset’ (2000), an award-winning, experimental drama screened at the Tate Modern that follows the transformation of the painter through impairment, and ‘The Real Helen Keller’ (2000), a documentary commissioned by Channel 4 and co-produced with Ann Pugh. More recently, her durational performance, ‘Bedding Out’ (2012), toured the UK to expose the impact of welfare benefits reforms. This was followed up in 2015 with ‘Figures’, a mass-sculptural durational performance which made visible the human cost of austerity, exploring critically the implications for disabled people and the wider population. Building on this, she is undertaking a doctorate exploring forms of activism. We would like to thank the NDACA CIC, Graeae, Disability Arts Online, the Research Centre for Museums and Galleries, DaDaFest, and Signdance Collective. We would also like to thank all the disabled people and allies who made the Disability Arts Movement possible.